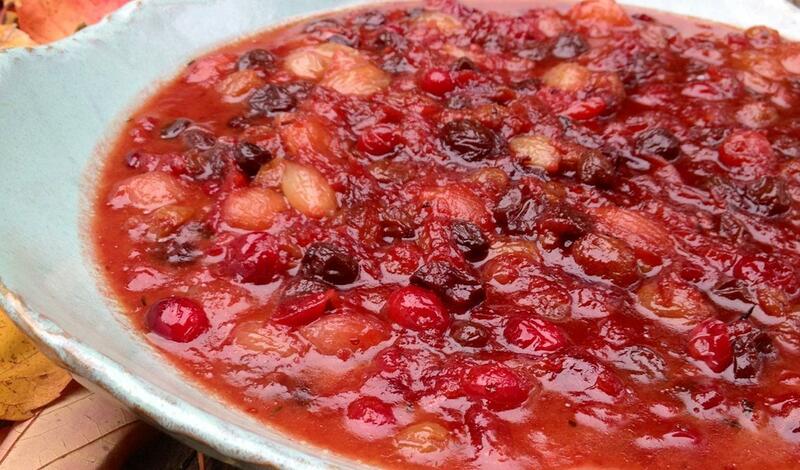 Adapted from my Aunt Sandee’s recipe, this compote is a staple at our Thanksgiving feast. As it simmers, it will fill your kitchen with a warm, inviting aroma. Soak the raisins in the warm water. In a large saucepan, combine onions and butter and cook on medium high heat until butter is melted. Add sugar, vinegar and cook on high heat, stirring occasionally, until the mixture turns a golden caramel color, about 10-15 minutes. Add remaining vinegar, wine and orange juice and boil for 2 minutes. Add raisins with soaking water, cinnamon stick, thyme, garlic and salt. Bring to a boil, then reduce to a simmer and cook, covered, for 1 hour. Add cranberries and simmer, uncovered, for another 30-45 minutes until thick. Remove and discard the cinnamon stick. Serve warm. Adjust the seasoning or consistency if necessary. If you have a tart batch of cranberries, you may need to add a little more sugar.Add water to make it thinner (it will thicken as it cools) or cook longer to make it thicker. This recipe can be made a day in advance.Reheat in a saucepan on low until warm. The sweet and tart flavors make this a perfect complement for turkey, but it’s also delicious with chicken or roasted pork.